PIZZA TEEN! 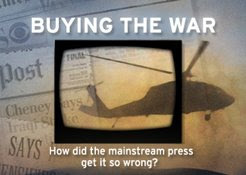 : Bill Moyers Journal: "Buying The War"
Continuing with a somewhat sober week here on PIZZA TEEN!, I just wanted to provide a space for disseminating Bill Moyers' excellent & important feature-length report "Buying The War" which picks through the smoldering carcass to understand the failure of the mainstream press and its role as an enabler of the lies crafted to sell the war. "Four years ago on May 1, President Bush landed on the aircraft carrier USS Lincoln and delivered a speech in front of a giant 'Mission Accomplished' banner. Despite profound questions and the increasing violence in Baghdad, many in the press confirmed the White House's claim that the war was won. How did they get it so wrong? How did the evidence disputing the existence of weapons of mass destruction and the link between Saddam Hussein and 9/11 continue to go largely unreported?" You can view the report on Bill Moyers site here. Or jump right into it, starting with the video below. Part 2 - Part 3 - Part 4 - Part 5 - Part 6 - Part 7 - Part 8 - Part 9 Where's the Walt Disney cartoon about this foolishness?